As the days grow longer, the action is cranking up in Cumberland County, Pennsylvania, and our hometown of Carlisle. Some of summer’s top events are scheduled for the weeks ahead, so grab your calendar and make a date to have fun. You tell us! The 2018 Best of Cumberland Contest wants your opinion on 129 different categories. The contest runs through May 31, 2018, so sign in now to vote. Winners will be announced on July 18, 2018. More than 3,000 vehicles will be on display at the Carlisle Ford Nationals, the biggest Ford-themed weekend in the world, set for June 1-3, 2018 at the National Parts Depot showfield. Check out indoor displays of concepts, custom and historically-significant cars and trucks. There will also be a burnout competition, kids activities, special guest designers, giveaways, and autocross for all skill levels. Friday – Saturday, 7:00 a.m. – 7:00 p.m.
Sunday, 7:00 a.m. – 12:00 p.m.
Three weeks later, the Carlisle Chevrolet Nationals come to town, taking over the fairgrounds on June 22-24, 2018. The three day weekend is a great time to see a history of General Motors vehicles, from vintage muscle cars to the latest Camaro. Find a wide range of GM products, plus multiple vendors, and an all-General Motors car corral. Autocross, industry guests, kids activities, and more add up to a fun-filled weekend. Carlisle’s rich history goes all the way back to Colonial times (George Washington’s first army school was here). The town was home to the Carlisle Indian Industrial School, which graduated Olympian Jim Thorpe. And it’s the location of Dickenson College, the first college chartered after the Treaty of Paris. You can learn all about our wonderful town on a Walking Tour of Carlisle Wayside Markers. Download the tour guide and let it lead you on a leisurely and informative stroll through the Historic District and beyond. 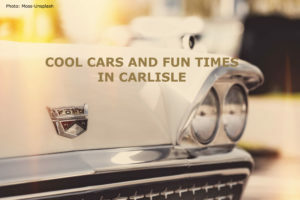 Book a room with us at Carlisle House—one of the Select Registry Distinguished Inns of America—and you’ll be in the heart of the Historic District and near to all of summer’s best activities. Call us today! This entry was posted in Events, Historic Tours and tagged Area Events, History, Things to Do by admin. Bookmark the permalink.